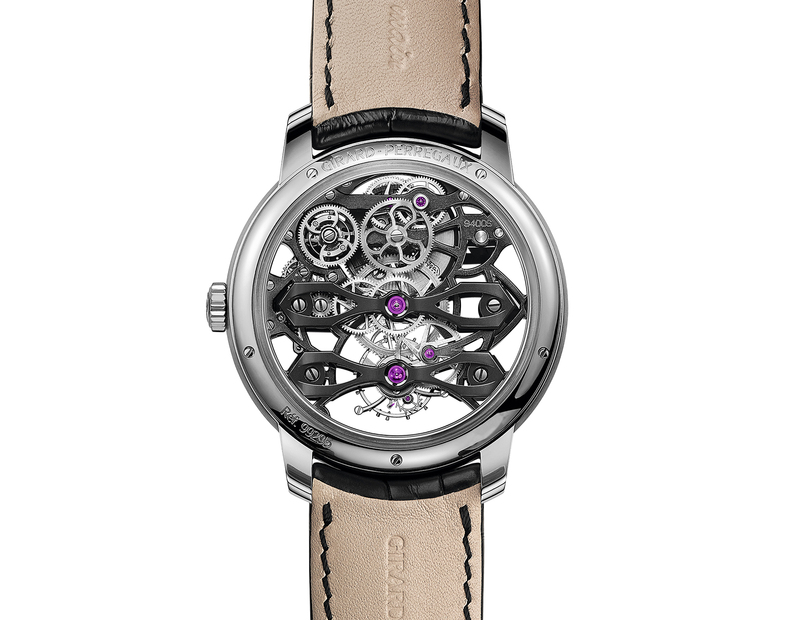 The modernist Tourbillon with Three Gold Bridges gets the open-worked treatment. Girard-Perregaux radically reimagined its signature Tourbillon with Three Gold Bridges in 2014 with the Neo Tourbillon, a sleeker, cleaner and more affordable take on its iconic tourbillon watch. While retaining the signature movement layout, the Neo Tourbillon instead relied on skeletonised, arched titanium bridges, effectively ushering the original design that dates from 1884 into the 21st century. 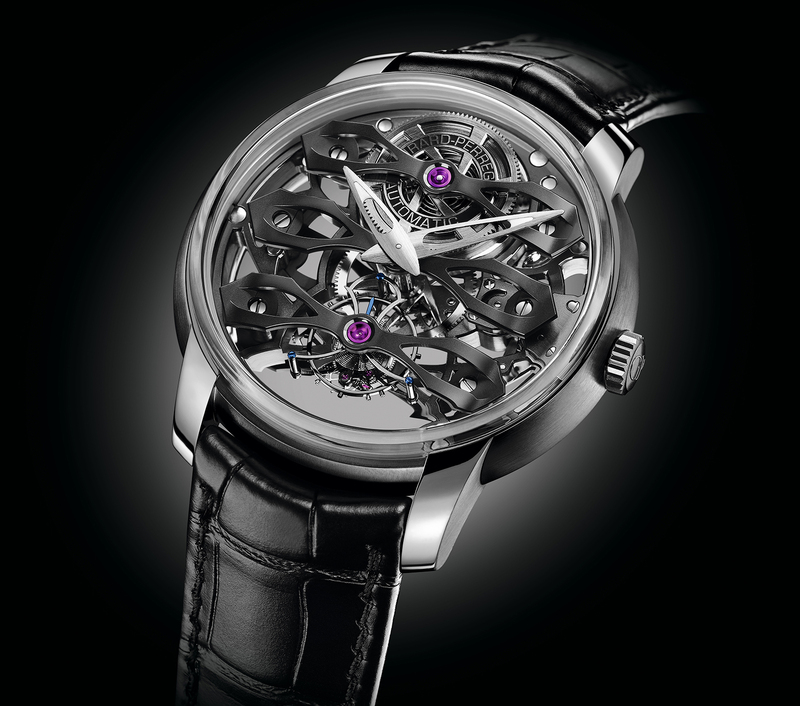 And now just days away from SIHH 2018, Girard-Perregaux has turned it up a notch with the Neo Tourbillon With Three Bridges Skeleton. The skeleton version is essentially an open-worked variant of the original, but with a few subtle twists. Evidently, the cal. 9400-0011 inside was more of an exercise in reduction than skeletonisation as the base plate has been reduced to two titanium bridges, one each for the gear train and tourbillon, mirroring the bridges on the front. The two bridges on the back are also arched, explaining the increased thickness of the watch. Above them, a skeletonised winding wheel is positioned at 11 o’clock next to the ratchet wheel with lyre-shaped spokes. Once again in titanium, the case measures the same 45mm in diameter but is 1.4mm thicker than the original Neo Tourbillon, standing at 15.85mm high. That’s due to the “box-type” sapphire crystal case back that accommodates the reworked movement that’s now 9.54mm, mainly due to the arched bridges on the back. The thickness of the caseband, however, remains unchanged. As with the original, the case has no bezel so the domed crystal sits directly on the case, giving pride of place to the movement. The movement is laid out in a linear fashion, with the barrel, gear train and tourbillon arranged vertically, held in place by three PVD-treated titanium bridges. The movement offers a 60-hour power reserve and is wound by a white gold micro-rotor, which is positioned co-axial with the barrel. Notably, the tourbillon carriage is also made of titanium, weighing just 0.25g despite being a large 14.44mm wide. 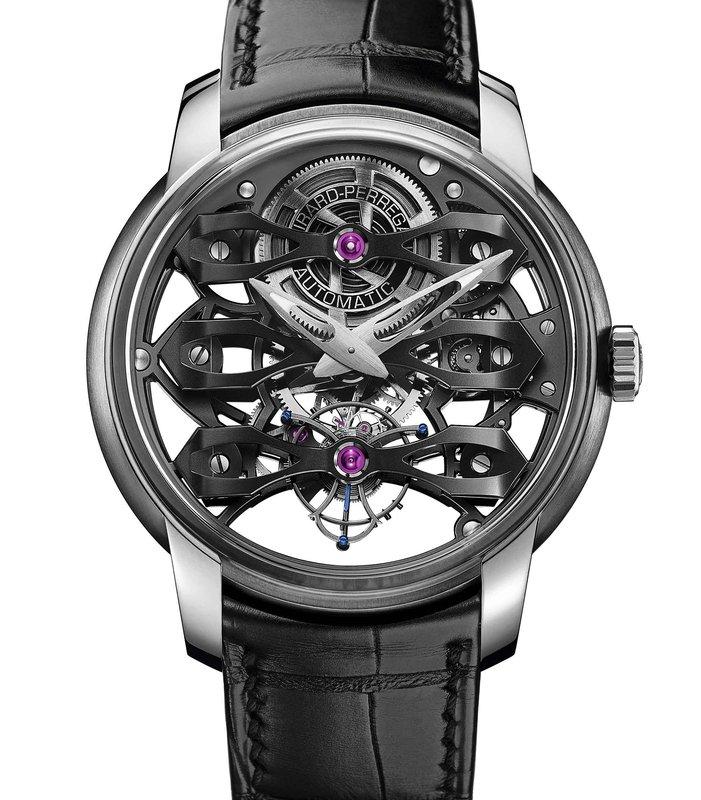 The Girard-Perregaux Neo Tourbillon With Three Bridges Skeleton (ref. GP 09400-0011) is priced at SFr140,000 or S$204,900. The luxury sports watch gets a see-through movement. A modern take on the iconic Tourbillon with Three Gold Bridges, the Neo Tourbillon is now available in a DLC-coated titanium case that lets the gilded gears and tourbillon regulator take centerstage.